In mathematics, if-then statements are statements that proves if something happens then something else will happen. If you water your plants every day, then your plants will grow. If you mix red with white, then you get pink. If you swim without a life jacket, and you don’t now how to swim, then you’ll drown. The two-letter word “if” is pretty loaded. 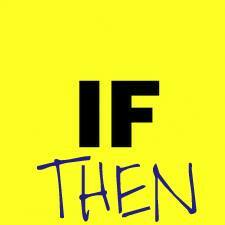 If: conjunction, introduces a conditional clause. Now that we know this, what exactly does it mean when God gives us an if-then statement? Sometimes we forget that God expects something from us to receive all that He promises. His promises are conditional; it sounds crazy since He’s known to be such a loving, giving God, but much like we expect from one another, we must do something to receive something. When we look at the principle of doing something to get something in our everyday world, we have to give up “stuff”; our time, our money, someTHING to get what we want from others. We put these contingencies on each other all the time. My daughter knows that IF she wants to watch TV after school, then she must do all of her homework. So how does all of this bring us back to God’s love affair with the if-then statement? When God puts a contingency on us, we have to do something. We have to believe, have faith, be obedient, stop this or stop that. What is the reward? Everlasting life, divine manifestations, restored relationship, healthy hearts, minds, and souls. What He demands from us isn’t nearly as much as our bosses, families, or friends require of us. Really, it isn’t. We win on the side of “then” with God every time. And, in this case, He wins too. Yep, God is winning! *Charlie Sheen voice* when we do what He asks of us. How? Because every act of obedience strengthens our witness, gives greater glory to Him, and opens up greater room for Him to bless us — not for OUR benefit, but for His kingdom’s benefit. We want to have good heart motives when we work in God’s equation of life; He knows our hearts and ill motives will never produce the results we want. The purpose of today’s blog is to remind us that God expects for us to do something to get something from Him. Salvation wasn’t free, neither is anything else He promises us. What are you will to give up (if) for His divine (then)?